The Newcastle Systems PC Series Powered Picking Workstation offers many of the same standard features as the NB Series. It has been designed to hold and power a variety of additional equipment, yet also provides generous space to hold inventory. 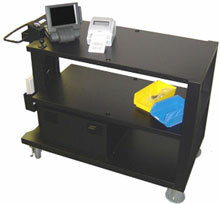 The PC Series consists of 30" (762 mm) and 48" (1,219 mm) deep workstations that are designed for ease of mobility. (60" model discontinued) With high performance 6" (152 mm) rubber casters and narrow profile they can be moved and positioned with minimal effort ensuring operator usage throughout a facility. The top shelf is ergonomically adjustable and can be set at 3 different heights to suit the operator and the task being performed. The optional middle shelf is also adjustable in height. The bottom shelf holds the power package and is accessible as needed. It can also be used for additional storage space.